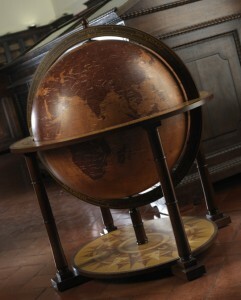 The Italian Supremo bar globe from Zoffoli’s GEA collection look like a vintage replica, but the world globe features a current world map. Would you park your 1923 Duesenberg on the street instead of in your garage, or take your brand new Aston Martin to an automated car wash? I hope not. Select treasures, both old and new, demand attention – no matter what they are. Inspect your globe before cleaning it and proceed only if there is no damage or weak spots. To remove dust, wipe the surface gently using a soft, dry cloth. Don’t use spray or furniture polish. If you notice areas that are beginning to peel, have it repaired. The cloth can catch one of these areas and make matters worse. If your antique needs more than a bit of dusting, here’s our 2-step, easy-to-follow instructions on how you should clean it: 1) Don’t 2) Find an experienced, reputable conservator to clean and/or restore it. The web has many suggestions about how to clean antiques written by people claiming to be specialists. Unfortunately many people ruin their cherished treasures by following their advice. Improper cleaning can destroy the map on an antique globe, so make sure any “specialists” you consult really do know what they’re doing. Professional conservators can do quite a bit. They can retouch and stabilize it and repair the shell. If the map has missing or damaged pieces, these can often be replaced with printed reproductions that are tinted to match the rest. Sometimes conservators can even reduce or even reverse discoloration and yellowing. High quality vintage-style replica globes need to be cleaned just as carefully as authentic antiques, because more than likely the map of your wooden globe will have been made in a similar manner. This consists of using printed pieces of paper called paper gores, adhering them to the shell, and then varnishing them. Inspect your globe before cleaning. To dust, gently wipe the surface with a soft, dry cloth. If you see peeling or weak spots, have it repaired first – cloth can get caught on one of these areas and increase the damage. If dusting is insufficient, clean the surface of the globe with a dry, soft cloth. Work in small sections, wiping away (don’t scrub) loose dirt. For excessive stains, try moistening a soft cloth with plain water but be very careful. Read the section below, because sometimes some dirt or stains are preferable to a damaged globe. Wring the cloth out extremely well or spray water onto the cloth (never onto the globe). The strength of varnish has come a long way over the centuries, but that doesn’t mean your globe is completely sealed and waterproof. Excess moisture left on the surface may be soaked up by the map, so don’t allow any water to sit on the surface. Dry the area immediately with a soft, clean cloth. If this still isn’t enough, you can risk mixing the water with a bit of mild soap or detergent and repeating the steps above. Cleaning without causing damage depends on how careful you are, what potentially harmful materials are in the detergent, and how well your globe reproduction or bar globe replica has been manufactured. Never use harsh or abrasive materials or solutions containing alcohol or solvents. How do I clean the metal ring that is around the globe? I am not sure why it is made of. Dear Jeff, the metal meridian ring can be made of brass, steel, sometimes even aluminum; however it is usually covered with a special lacquer (varnish). Clean it, just like the globe itself, with a slightly damp soft cloth. Never use any type of solvent or abrasive detergents to avoid altering the coating, especially if the globe is Italian – the varnish is hand made. And even though the ingredients are made to endure UV light, do not expose the globe furniture to direct sunlight. An idiot knocked over my grandfather’s globe from WW2, it cracked in half. How and what do I use to fix it? Dear Sage, that’s awful. Without seeing a photo I can’t really be that specific, but I would suggest looking up someone who deals in antique furniture restoration and if the map on the globe itself is torn or damaged I would suggest finding a person who restores paintings. Unfortunately no one even makes globes with the same technology that they used to back then anymore. Found an old bar globe at a yard sale… pretty sure I can salvage most of it but the paper the map is made from is peeling, cracking and in general in poor condition. Is there a source to get a replacement “skin” for it? Dear Clint, I apologize that it took so long to reply to your comment. We were having some technical difficulties on our website with comments due to an abundance of spam, but now we have the proper tools to handle the real messages from the fake ones. Unfortunately most manufacturers/distributors do not sell replacement decals. This is because adhering the printed map to a round surface and having it line up is a difficult process and must be done by professionals. However if that particular model is still being manufactured it is most likely possible to purchase a replacement globe sphere. If you would like to send us a photo we can try to identify the manufacturer. I’d be really grateful if you could give me some advice on how to repair the damage to my bar globe (if possible). Do you have any email address I could send some pictures to please?